Contest: Want to See RESIDENT EVIL: VENDETTA for Free?? Want to see the latest installment of Resident Evil? Of course you do. What’s better than zombies and Resident Evil, right? Well I have 5 free passes to give away to see the film at 7pm on June 19 at AMC Northpark in Dallas, TX. I’ve always been a fan of the Resident Evil video games and films, no matter who cheesy or bloody they are. There is a certain nostalgic element to these games with the right amount of wit and thrills. Send me an email to boomstickcomics@gmail.com with the subject line ‘Resident Evil Dallas‘ and tell me what your favorite zombie movie is and why. Bonus points for mentioning your favorite zombie death. I will notify the winners on Friday the 16th. Also, please let me know how many tickets you will be needing in your email. Official Synopsis: RESIDENT EVIL: VENDETTA is the third installment in the massively popular CG animated film franchise, following “Resident Evil: Degeneration” (2008) and “Resident Evil: Damnation” (2012), and will premiere in U.S. movie theaters on June 19 only. Exclusive to the U.S., this not-to-be-missed one-night cinema event includes a specially-produced introduction from the cast and behind-the-scenes footage. 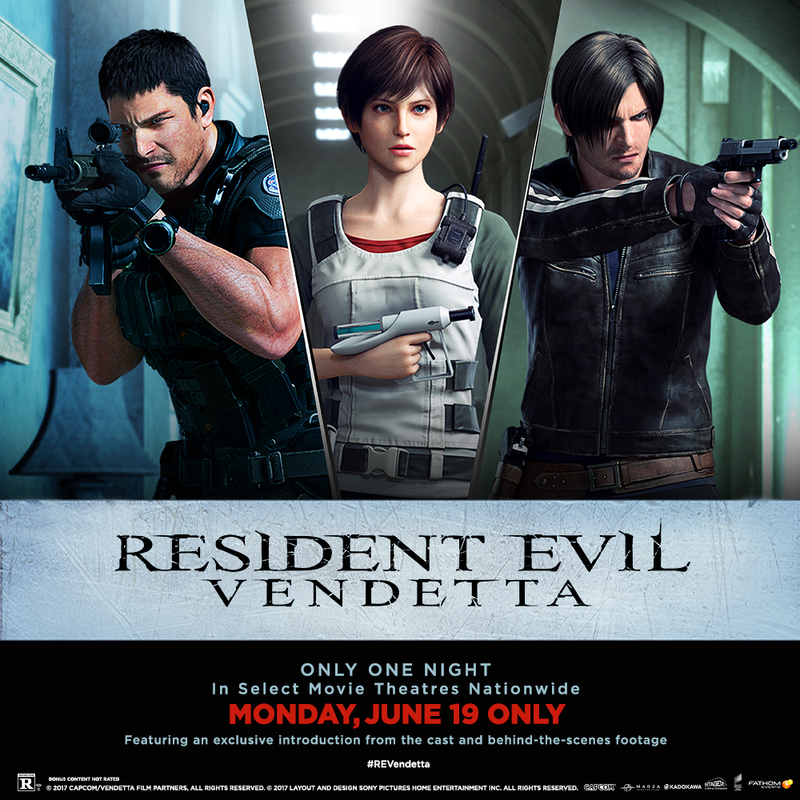 Derived from Capcom’s Resident Evil™, one of the bestselling video game franchises of all time (72 million + copies sold), “RESIDENT EVIL: VENDETTA” features the fan-favorite characters Leon S. Kennedy (Matt Mercer), Chris Redfield (Kevin Dorman) and Rebecca Chambers (Erin Cahill). CLICK HERE TO PURCHASE TICKETS AS WELL! This entry was posted on Friday, June 2nd, 2017 at 3:49 pm	and is filed under Film, News. You can follow any responses to this entry through the RSS 2.0 feed. You can skip to the end and leave a response. Pinging is currently not allowed. [Padme exits her ship and runs towards Anakin] I was so worried about you! Obi-Wan... told me terrible things! He said... you turned to the Dark Side. That you... killed Younglings! ...He knows. He wants to help you. Anakin, all I want is your love. Love won't save you, Padme! Only my new powers can do that! At what cost? You're a good person; don't do this! I won't lose you the way I lost my mother. I am becoming more powerful than any Jedi has ever dreamed of, and I'm doing it for you: to protect you. Come away with me... help me raise our child; leave everything else behind while we still can! Don't you see? We don't have to run away anymore! I am more powerful than the Chancellor, I... I can overthrow him! And together, you and I can rule the galaxy! Make things the way we want them to be! ...I don't believe what I'm hearing... Obi-Wan was right... you've changed! [with an angry look and voice] I don't want to hear any more about Obi-Wan. The Jedi turned against me; don't you turn against me? [crying] Anakin, you're breaking my heart! And you're going down a path I cannot follow! Because of what you've done... what you plan to do! Stop! Stop now; come back... I love you! You're with him! You brought him here to kill me! [Anakin releases Padme, as she falls unconscious] You turned her against me!